Last month, the NTMA sold the first ‘century bond’ in its history – €100m-worth of Government paper maturing in 2116 and priced at a yield of 2.35%. Given the current pricing of 30-year bonds, a comparable US bond would yield around 5.7-6.0 % if the US Treasury actually tried to issue one. The 100-year bond was a symbolic point for Ireland. Coming while the country commemorated the centenary of the 1916 rising, it was a marker of final departure from the unprecedented (in scale and nature) financial and economic crises of 2008-2016. As a signal, it was of immense value for the political elites of the state, even if of zero economic or social value to ordinary people. Yet the irony was there for anyone to see: another 100-year bond was issued by Mexico back in 2015. Super-long-dated debt, it seems, is neither a sign of economic success, nor a signal of institutional maturity – a point missed by the Irish tax-and-borrow -and-spend cheerleaders. To understand that, it is necessary to look at the political dynamics in post-election Ireland. Just as Irish borrowing costs continued to trace historical lows, the country’s political crisis was in full swing. Two months without a Government would have put any normal economy onto a negative watch with the bond-rating agencies. But in the case of Ireland, no one seemed to care – the markets chugged along, cheering the fortunes of this debt-laden country, and buying Irish debt to beat the band. 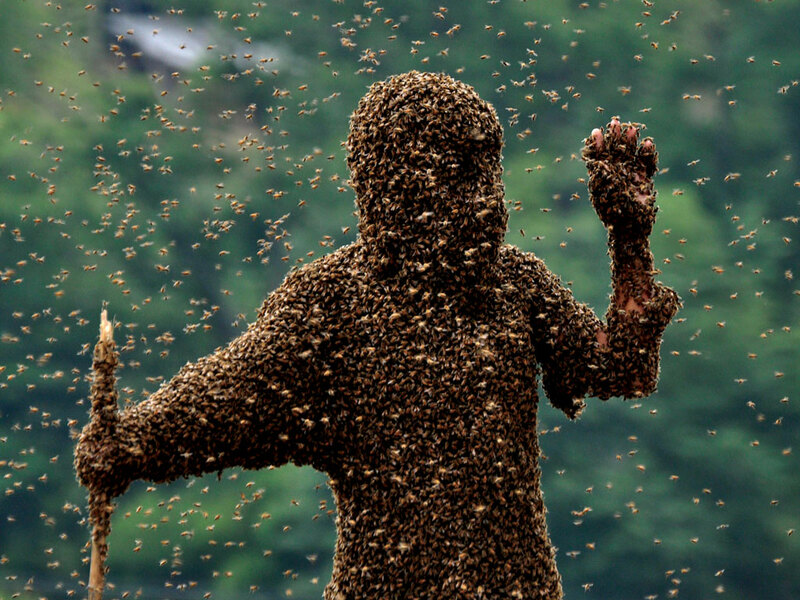 What if the bees buzz off, or even if they don’t? This is in stark contrast to Ireland five years ago, when yields on Irish 10-year bonds hit highs of 14.2%. Today, they are sitting at around 0.7%. Much of this is driven by the ECB’s policy of quantitative easing, that saw Frankfurt buy billions worth of Irish bonds, dropping rates and propping up ‘private-sector’ buyers of Government debt. But much of it is also down to global investors’ ignorance of the economic conditions underwriting the solvency of the Irish Exchequer. Let’s take a look at the key sources of sovereign risks. Politically, the Irish legislature and government establishment now resembles a beehive with lots of buzzing and little serious long-term output. The resolution of the stalemate at the top of the Government ‘Confidence and Supply’ pyramid, seemingly achieved by the grand ‘facilitation’ agreement between Fine Gael and Fianna Fáil is a temporary bridge across the gaping chasms between the Irish electorate and the country’s elites. This chasm is best highlighted by the lack of any policy coherence driving the two parties. The problem, from the long-run policy point of view, is not the expected duration of the Government, but the policy vacuum that it is likely to engender. 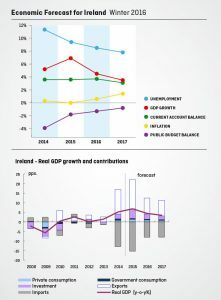 The agreement between FF and FG suggest that the Government will focus on ‘spend more, tax less’ objectives that are based on the implicit assumption that strong economic growth will last the next three years. Hence the rumoured commitments include: reviving 24-hour cardiac care at Waterford Regional hospital, spending more on policing (solely on expanding the Garda ranks and supporting pay increases in the force), ‘investing’ in other public services (read: increasing pay and hiring), extending mortgage-interest relief, subsidising access to housing for public-sector workers, and expanding the Rent Supplement scheme. The game of plodding political chess since the 2016 General Election has been about giveaways for October Budget 2017. Over the course of negotiations, Fine Gael has moved from a €500m commitment to over €1bn in spending and tax cuts, without any new resources being identified to fund it. And that is before we cost in the Fine Gael and Fianna Fáil commitment to replace the Lansdowne Road Agreement upon its expiration in September 2018. For this, the Coalition has agreed to create yet another quango. No prizes for guessing which direction taxpayers’ cash will be shovelled once it completes its work. All of this strongly signals that the new Government is willing to trade the competitiveness gains achieved through the suffering of private and public workers for Dáil votes in the near term. But it also signals the new Government’s total incapacity to focus on a long-term economic agenda. Which brings us to the second source of sovereign risk: the economic conditions underpinning Ireland’s miraculous recovery since 2014. 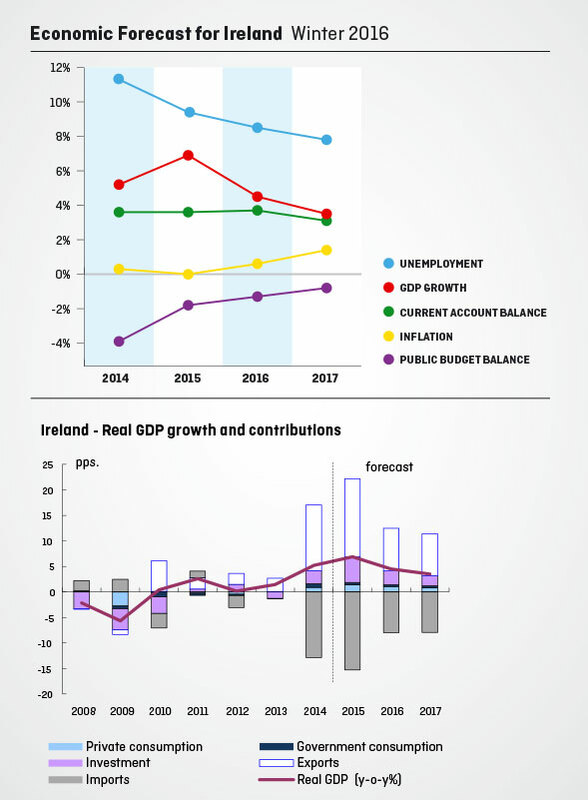 The aggressive fiscal expansion which Fine Gael will oversee will be built on expectations of robust growth in Government revenue. The expected sources for this growth, in turn, are sustained strength in corporation-tax and income-tax revenue, and an uplift in capital-tax revenue, due to real-estate buzz. These hopes carry significant risks; some are better understood than others, and all are linked to the prospects of the Government delivering long-term growth backed by policy that addresses four key threats to the Irish economic: rising interest rates, contracting investment in advanced economies, subversion of the Irish tax-arbitrage model, and re-orientation in global-trade flows away from our traditional export grounds. When it comes to interest rates, the risk of higher borrowing costs for the private sector in Ireland is a material threat to the sustainability of our growth model. The prospect of interest-rate normalisation in the US has recently led to downgrading by the major rating agencies of almost a third of the corporate bonds they rate. Meanwhile, in a research note issued in late April, Blackrock – one of the largest global fund managers with some $4.7tr in assets under management – warned that investors should be prepared for large-scale losses on their holdings of long-date US and euro-area government bonds. Blackrock notes that sovereign bonds are facing severe risks over the next five years from higher volatility and reduced liquidity conditions created by quantitative easing. Let’s consider the arithmetic behind the Blackrock warning. Currently, 10-year US Treasuries are trading at a yield of 1.70% – some 100 basis points higher than comparable Irish debt. Should Irish yields follow the US trajectory over the next five years, taking Ireland’s debt-maturity profile (currently extremely benign thanks to the NTMA’s efforts to convert short-term liabilities into longer-term ones), the budgetary impact of higher borrowing costs could be some €720-900m per annum. This alone could swallow almost the entire ‘fiscal space’ that was famously estimated to be available for the Government in the pre-election debates. 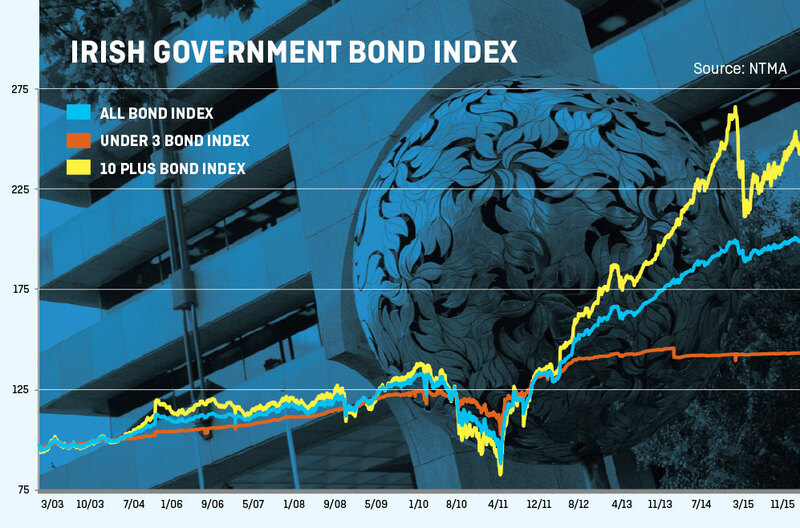 Returning Irish Government bonds to their 2003-2007 yields risks more than doubling even that high figure. Some, predominantly Irish, bond salesmen and the Government might say that these risks are not yet fully visible on the horizon. And they would be correct. Except for one pesky problem: serious institutional investors are already starting to worry about similar risks in the case of the US markets and they are increasingly coming around to the same conclusions on euro-area debt. Can Ireland claim an exception from the global trend for long? Private-sector investment here is also significantly exposed to changing global trends and fortunes. In recent months, investment funding for technology startups – the darlings of Irish enterprise policy and the cornerstone for our efforts at lifting otherwise anaemic (when measured as a share of total exports) indigenous exports – has shrunk in the US and across Europe. Just as Ireland’s business media exploded with positive stories about an influx of venture capitalists into Silicon Docks, the Silicon Valley firms were struggling to raise funding at rates of 2010-2015 averages. The number of US tech-sector IPOs (Initial Public Offers) fell in 2015 to its lowest level since 2010, as six-month post-IPO returns fell from the cycle high of just over 51% to 0%. Nineteen of 2015’s IPOs have posted negative returns to-date against four that managed to eke out positive ones. Eleven of the world’s largest twelve ‘unicorns’ have witnessed falling valuations over the last 18 months, according to data from T Rowe Price. Based on Dow Jones Venture Source analysis, US venture-capital funding volumes have fallen from $18bn in the first quarter of 2015 (1Q 2015) to $13.9bn in 1Q 2016. This puts 1Q 2016 funding at the second lowest quarterly volume in the last eight quarters, pushing median US tech start-ups valuations to their lowest levels in two years. Ireland’s strategy for stimulating indigenous growth is heavily dependent on both global tech fortunes and the inflow of venture-capital funding. Up to now, Ireland has been immune from the global tech-funding trends, but the question is how long can we dodge what appears to be a momentous re-focusing in venture-capital investments on corporate-finance fundamentals, such as cash-flows, earnings, net present value of investment and leverage risks. Again, there has been little political effort to deal with the problem. The previous Government attempted to focus on enhancing lending to start-ups and on securing more government-backed financing for equity. Both approaches are strategically flawed. The first increases leverage and thus undermines companies’ future fundraising potential. The second further squeezes out private investment and perpetuates companies and entrepreneurs dependence on state backing. Reflecting this, we see entrepreneurs careening into a handful of sectors that policymakers tend to think of as high-growth potential. This bias, in turn, exacerbates the already unbalanced development of our exporting sectors, as I show above. Beyond the risks, Ireland is a sitting duck for the vicissitudes of FDI and global trade flows. Here, the G20-originated process of reforming global tax-regimes, aimed at substantially reducing corporate tax-inversions and abusive tax-optimisation practices is a colossal ongoing threat. So far, the Irish Government has shown no imagination in addressing this challenge. And we are only undergoing the early stages of these reforms. What comes next is likely to focus on altering the taxation base on which Multinational (MNC) activities are assessed. Behold the April 2016 European Commission proposals on tax-transparency rules for MNCs which will force Irish-based MNCs to declare just how much real activity, as opposed to accounting trickery, is involved in their operations in every country in the EU. This will force the MNCs to pay tax on the basis of their actual activities in every country. The end game will be to dramatically shrink the pool of earnings that can be booked into Ireland from the rest of Europe by the MNCs and with it cut the tax base for corporation tax – the very same base that was responsible for most of our fiscal outperformance in 2015. What will our dinosaur Government’s likely response to that threat be? Judging by the protagonists’ historical performances and past policy aspirations – none, other than repeating ad nauseam the mantra that Ireland does not want US tax-inversion deals. The country is the largest recipient of ‘inverted’ investment in Europe and our Exchequer is not shy of taking on corporate tax revenues from inverted companies to spend on Government-favoured political targets. The FG-FF-Independent arrangement is unlikely to have anything up its sleeve in by way of response to the threat of shifting global trade patterns. Ireland is now heading blindly into TTIP (the Transatlantic Trade and Investment Partnership), a US-led trade agreement with the EU. TTIP disproportionately magnifies the market power of the larger corporations. As such, it could potentially erode some of the competitive advantages Ireland has in attracting FDI, particularly that of free access to EU markets. But it also has the potential to increase costs and raise competitive barriers for Irish SMEs trading into Europe. Not surprisingly, however, the blind deference to Brussels that characterises both our largest parties will keep Irish gazes down cast. Overall, exports (both indigenous and MNC-generated) remain a key pillar of the Irish economy. Since the start of the millennium, Irish exports of goods have been stagnant, despite numerous investment rounds by the State and multiple strategy documents issued across a range of sectors, from food to manufacturing. Our exports of services are, however, booming, driven predominantly by the new breed of MNCs in financial services; information and communications technology; and pharma. Despite all the efforts of previous Governments, and despite the policy rhetoric from both Fine Gael and Fianna Fáil around election time, Irish exports remain heavily concentrated in a small number of sectors and across a small range of products and services within these sectors. This dynamic faces two key new risks in the medium-term future: the risk of MNCs re-locating their key activities in line with changing tax structures across the EU, and the risk of global-trade-and-investment-induced shocks to the key sectors which drive the Irish economy. In simple terms, Ireland today has no policies in place to counter either one of these risks. And given the nature of the new ‘arrangement’ for government, welding together the already tired Fine Gael with incoherent independents at the behest of power-hungry Fianna Fáil, we won’t be looking for any.